Our shop is located in Becker, Minnesota. For contact information, go to the "Home Page"
We don't usually buy or sell pianos at our shop in Becker, MN. However, we offer to advertise your piano on this website on a "FOR SALE BY OWNER" arrangement. For more information about this service, click "our Services." 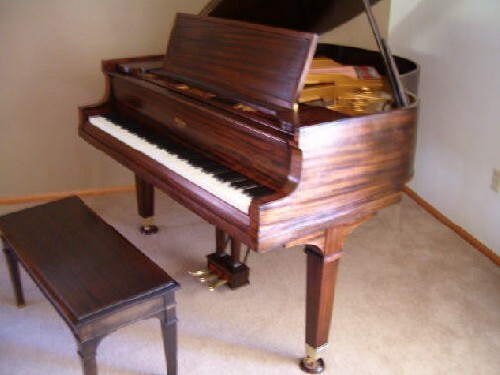 For questions about pianos located in Minnesota, phone us at (763) 262-4044 or send us an inquiry by email. For questions about pianos located elsewhere, contact us for owner information. For more information about each piano, click the picture or piano name. 1929 Baldwin "G" Grand 5'6"
1983 Young Chang Grand 5'1"